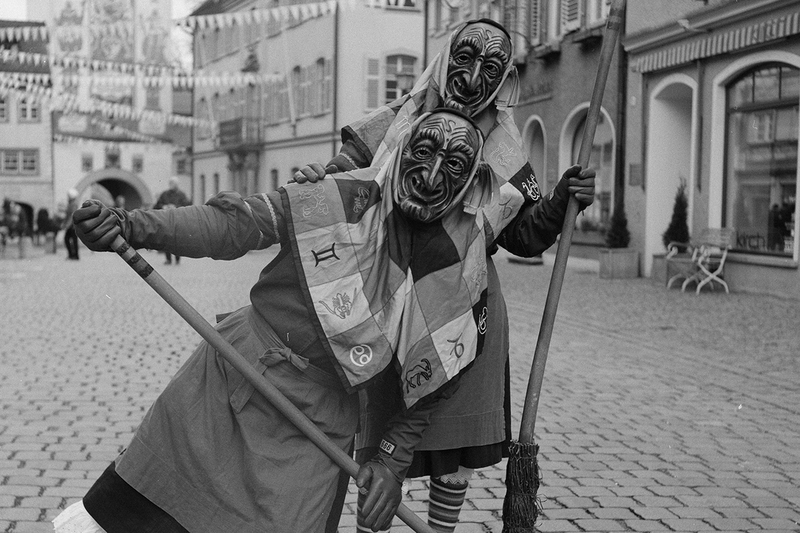 Tell us how the German Carnival series came about? I spent sixteen years documenting Haiti’s ‘Kanaval’ in Jacmel and the work was published in a book of the same name in 2010. 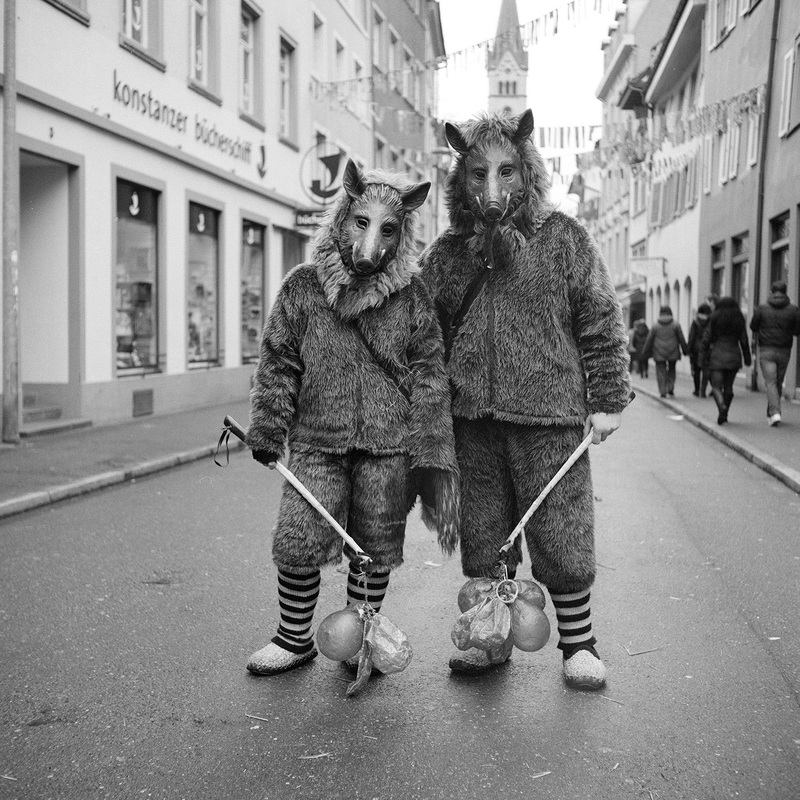 In 2014 I was invited by the MEWO Kunsthalle, Memmingen to document the Swabian-Alemannic Fasnacht – a form of carnival which takes place in South West Germany as well as Northern Switzerland. 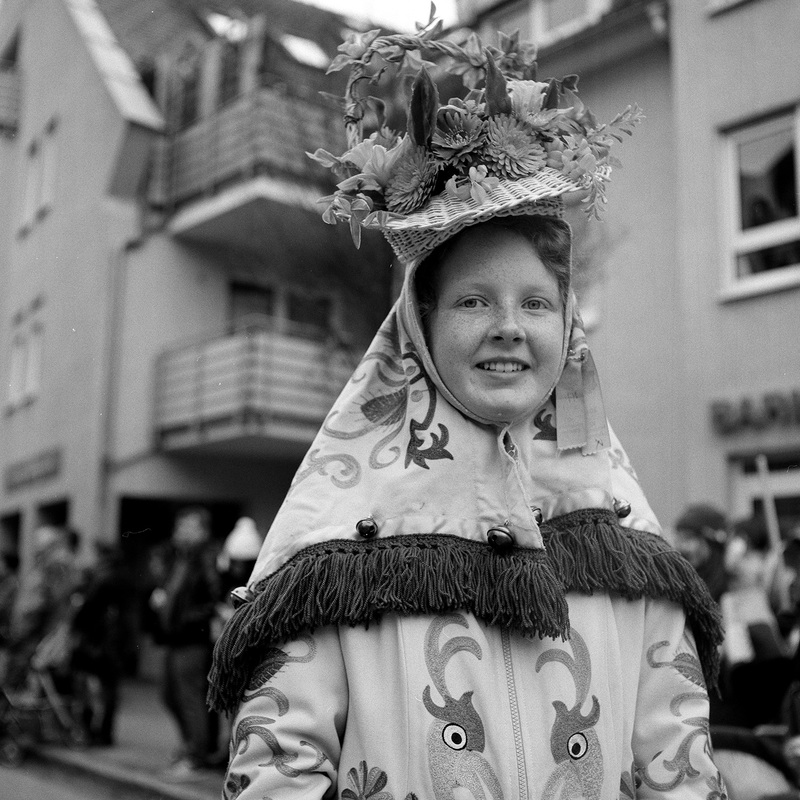 I visited three towns, starting at Konstanz, during the carnival period. 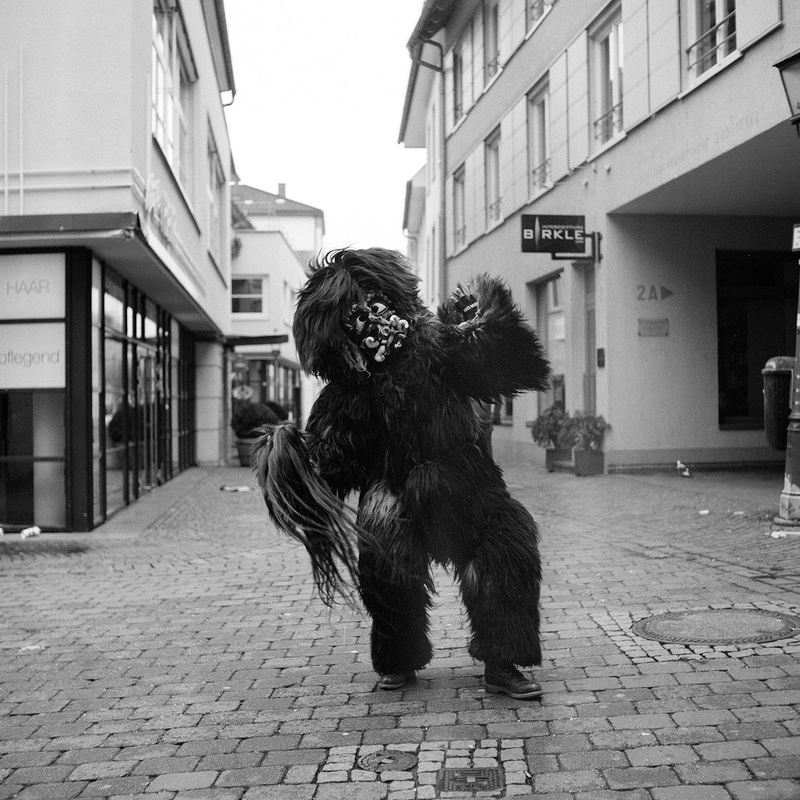 The Kunsthalle wanted me to employ the same process I had previously used for my project in Haiti, using a fifty-year-old mechanical analogue camera, black-and-white film, and a documentary method that has previously been called ‘performed ethnography’. This involves engaging with the subject, speaking to them, creating a reciprocal dialogue in which they are free to construct their own pose, before finally making the portrait. 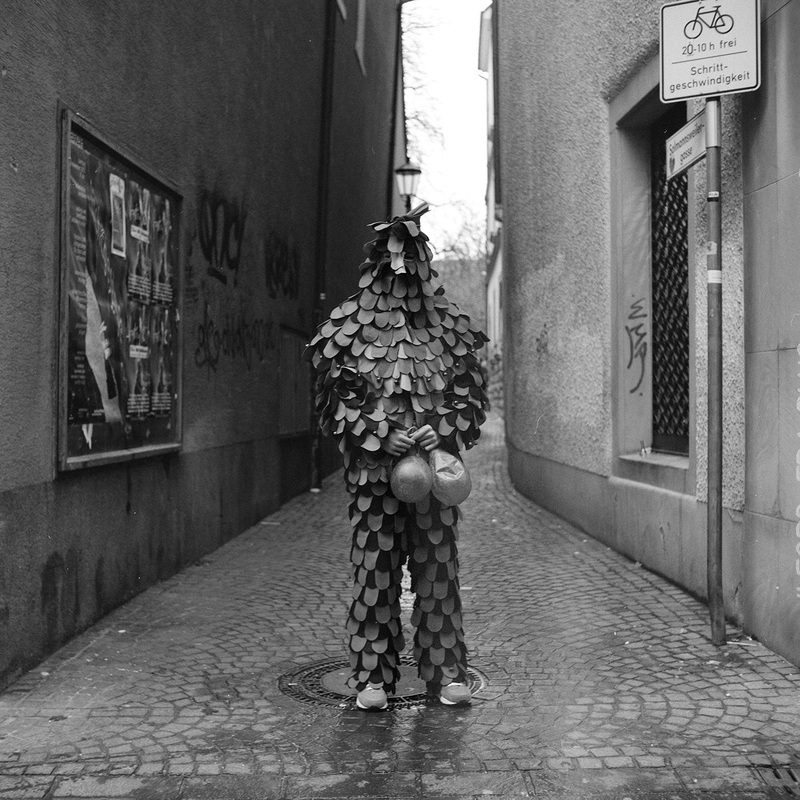 I mostly made the photographs in the Medieval lakeside town, Konstanz. The carnival was held at the same time as all pre-Lenten carnivals on the days which lead up to Mardi Gras when they come to an end the next day with Ash Wednesday. This was for an exhibition called ‘Alles Maskerade! 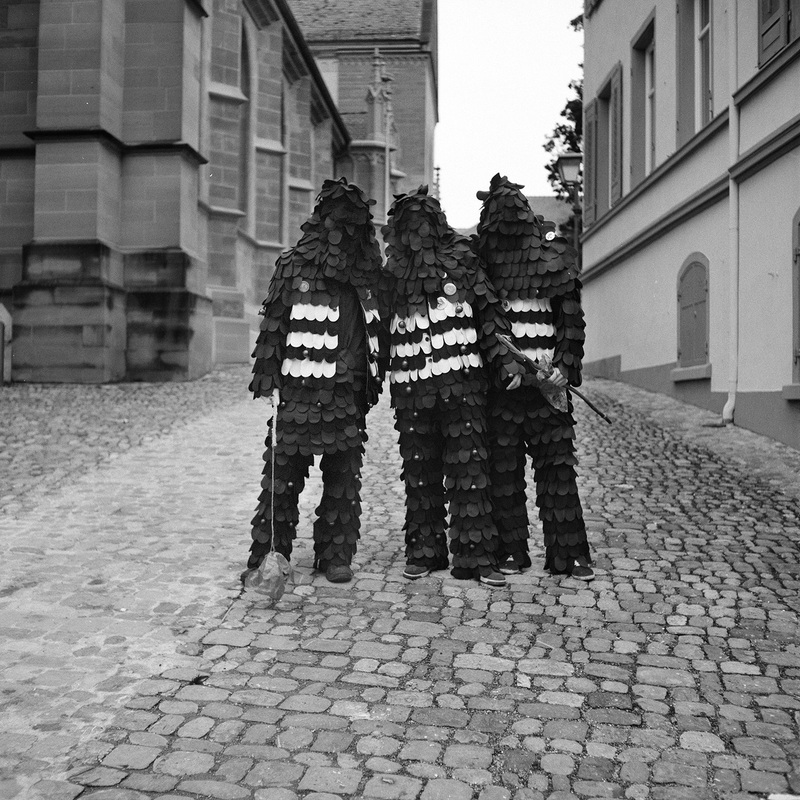 Fasching, Karneval & Mummenschanz.’ A two-part exhibition project, split between the MEWO Kunsthalle, Memmingen together with the Museum Villa Rot in Burgrieden, it explores the carnival through Modern and Contemporary artists, including Otto Dix, Jean Tinguely, Leigh Bowery, Sonia Boyce, and Adam Chodzko. An edit of my new work from Germany was shown opposite an edit of the Haitian ‘Kanaval’ project, extrapolating post-colonial correlations between them. 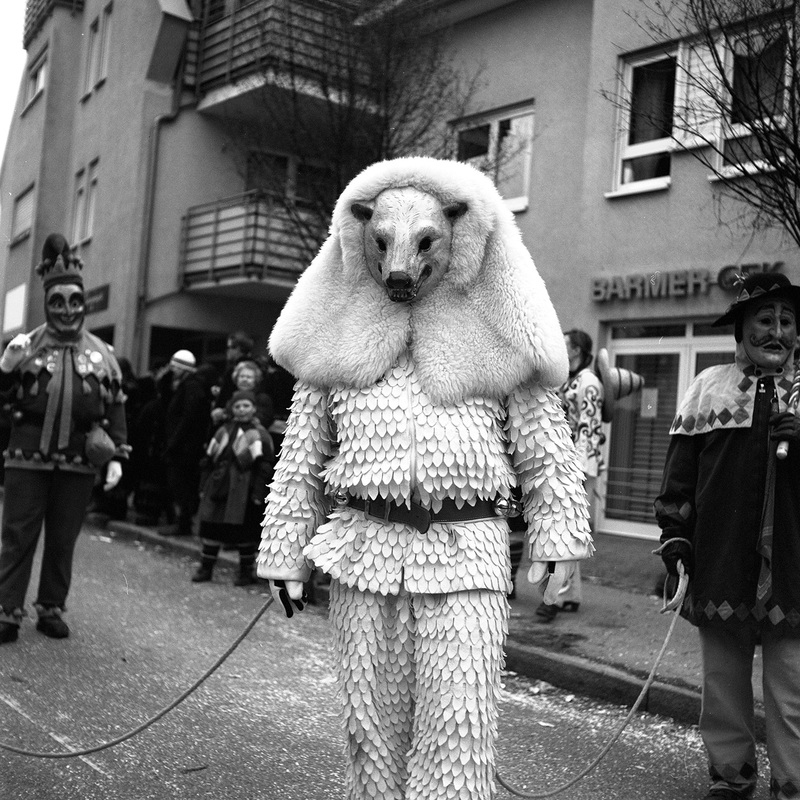 The outfits of the carnival participants remind me of fairy tales, myths and fokelore. 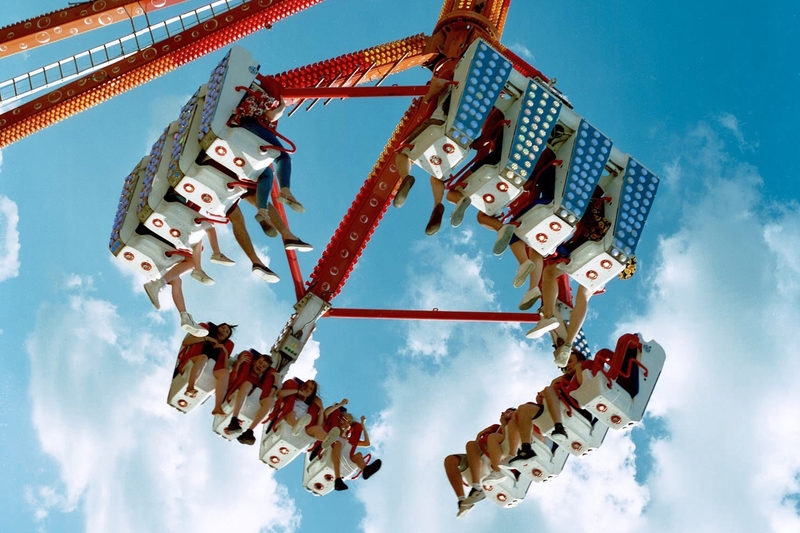 Did these things draw you to the carnival? 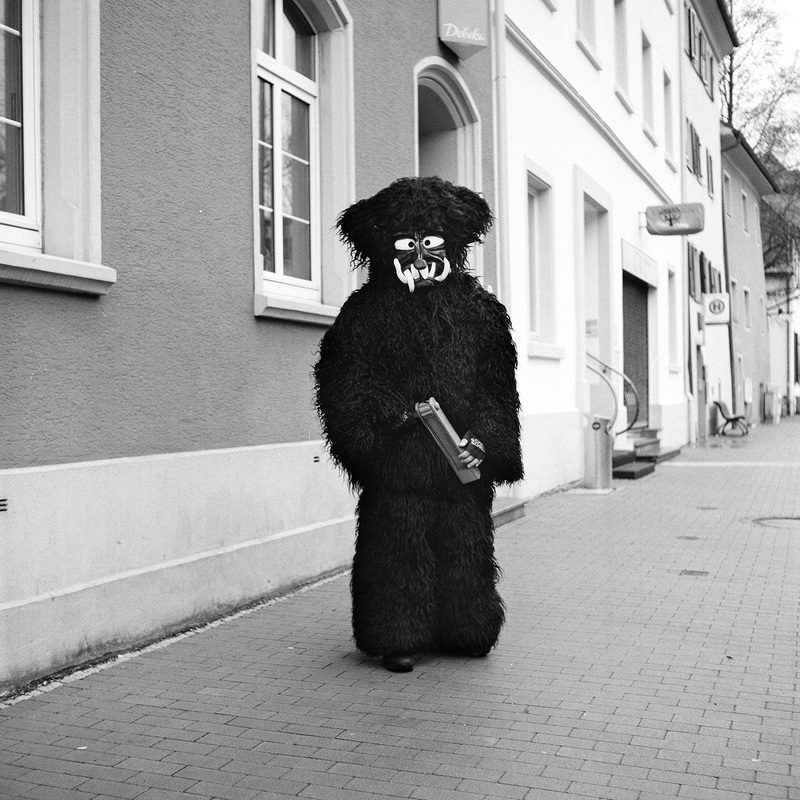 There are many archetypical characters on the streets during the Fasnacht ‘fast night’, referring to the nights before the Lenten fasting). 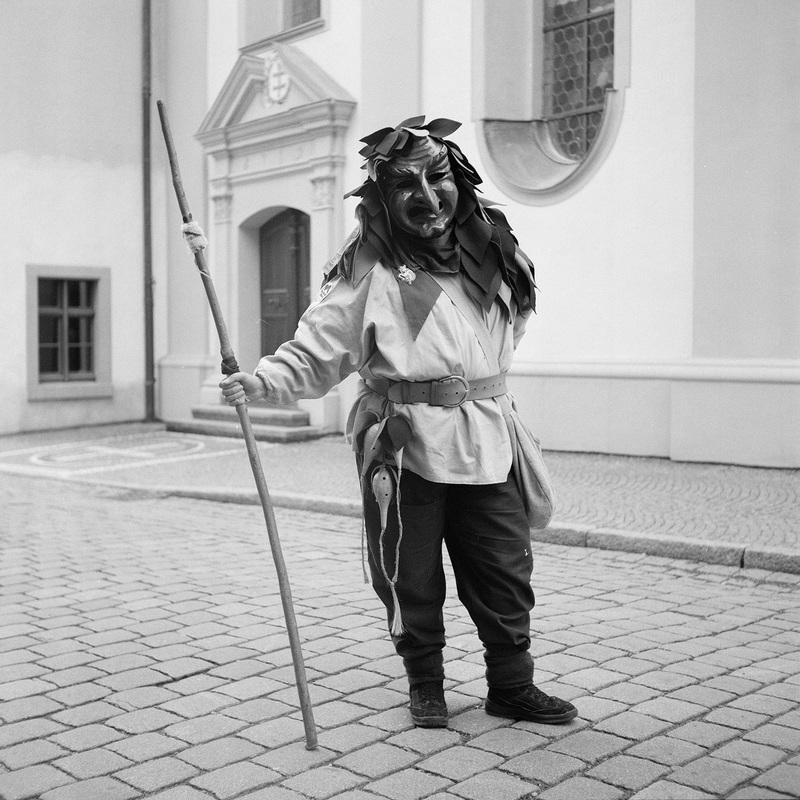 The most popular figures are devils, the fool, the witches, straw men, and wild animals. 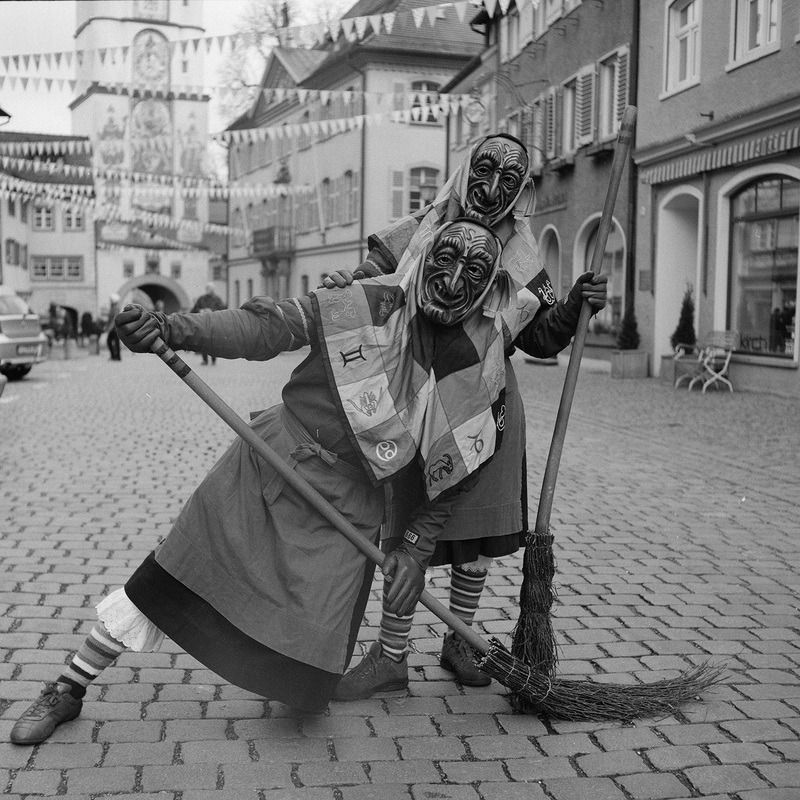 These are characters that belong to the folklore of the alpine peasantry, representing their religions, culture, and working lives as herdsmen and agriculturalists. Where does your interest in socio-cultural traditions stem? 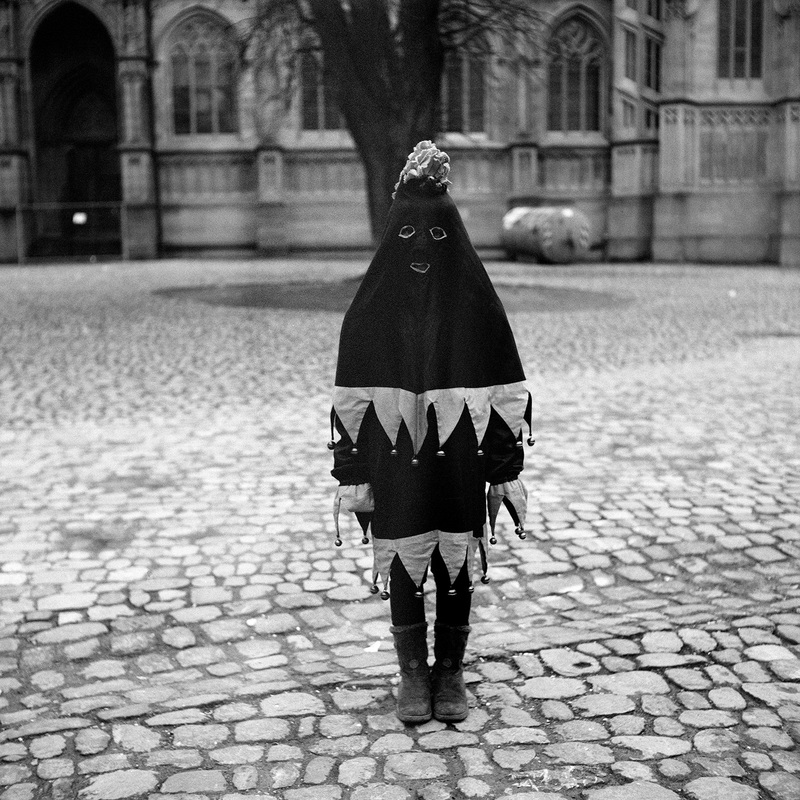 My attraction to carnival practice is part of a trajectory, a culmination of my love of folk traditions and people’s cultural histories. From the feminist folk punk band I sang and wrote the lyrics for in the mid-eighties, to my enduring love of British folk traditions from the Burry Man to the Hooden Horses of Kent; from my photographs of fairground ghost trains and streethawking children with Guy Fawkes, to my love of the ‘Face of Our Time’, photographic project of August Sander and the writings of political oral historian, Studs Terkel. I celebrate the times when people keep hold of their own traditions, their own histories, their own creativity and their own worth for their own class… without blanket consumerism and broadcast entertainment to dilute history. Do you participate in any ‘traditional’ activities yourself? I am not involved in any traditional activities sadly. I was particularly moved when I went on a nine-hour hike with the Burry Man who has been walking the same route on the streets of South Queensferry for the last thousand years. 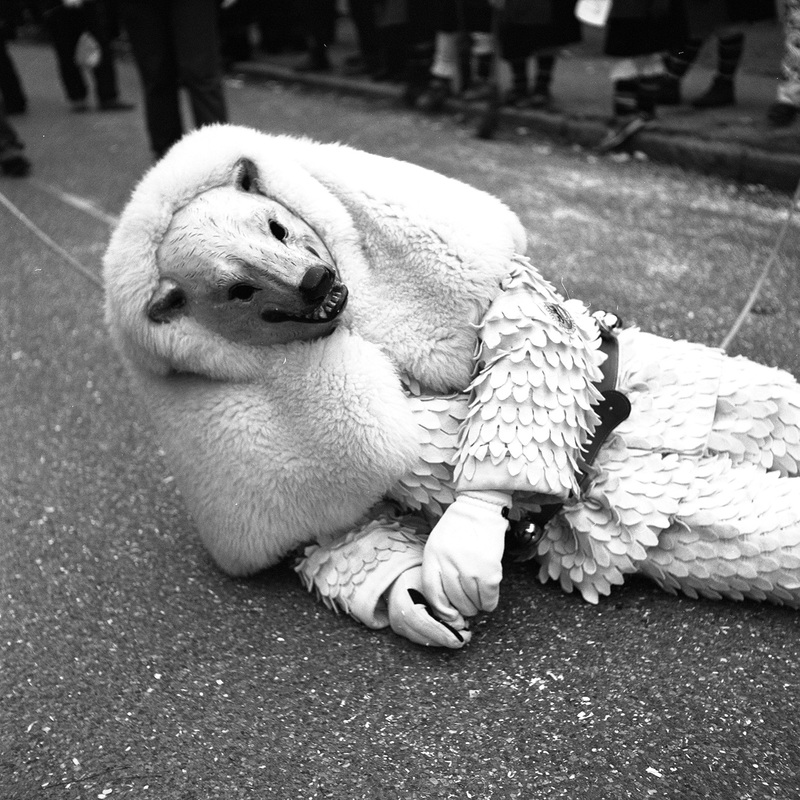 I saw how this tradition held the community together down through the centuries, engendered a sense of civic cohesion and pride, and also seemed to act as a marker for environmental degradation (as the 11,000 burrs needed for the costume were becoming harder to source due to over-zealous use of pesticides). But in another way, I also consider Punk to have been a ‘traditional’ activity which had an honourable ancestry from the Shakers, the Luddites, and the Levellers. 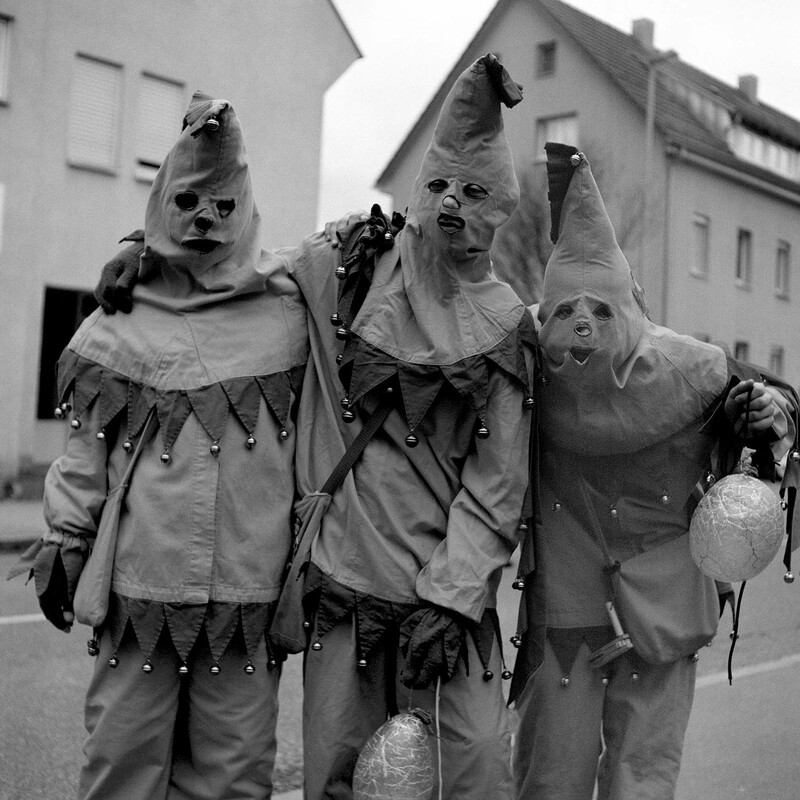 Carnivals are a generally known for being loud, colourful affairs, but you chose to shoot this series in black and white. Why was that? There is, for me, the sense that there is almost too much sensory information apparent during carnivals which include colour and movement. For me, the colour gets in the way of the mask and disguise, and perhaps I am just not a good enough photographer to deal with positioning colour, pose, background, and costume. There is always stasis in my images as the process, previously mentioned, takes a bit of time. But with the slow process a space between myself and the sitter is created which seems to leave the street and enter the territory of the old-fashioned portrait studio. The sitters strike poses reflecting their masked characters. 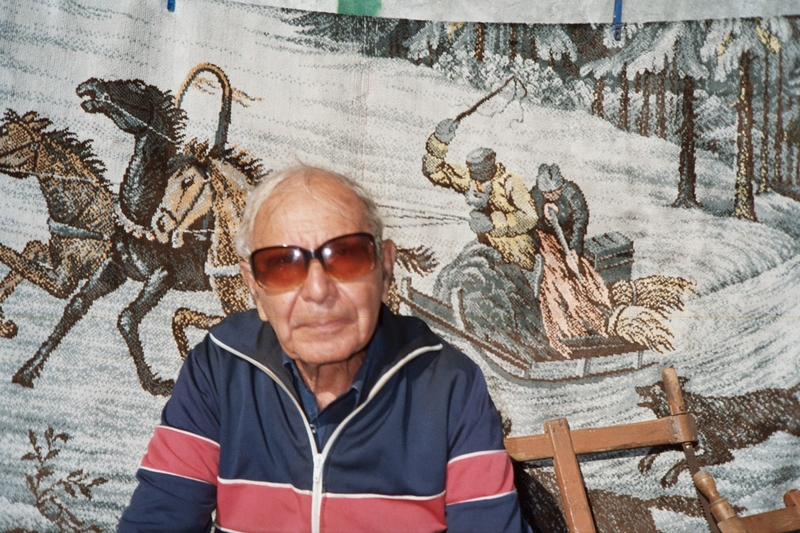 The time and space created seems to allow for a little of the historical narrative to seep through in a way that rapid fast cameras, needing no interaction between photographer and sitter, cannot. You travel a lot with your work, do you prefer working abroad as opposed to in the UK? I do actually prefer the light conditions abroad than in the UK. 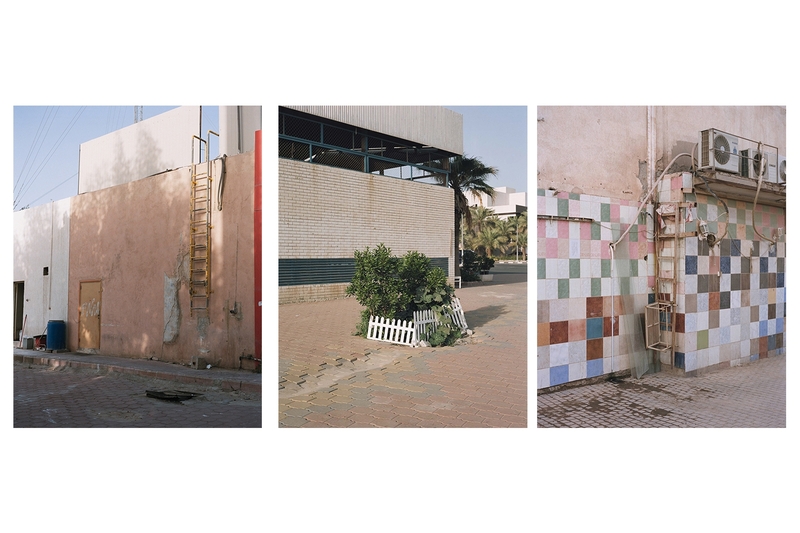 I also enjoy the challenge of negotiating the condition of re-presenting ‘the Other’, which is an ongoing process of mistakes, failure, aesthetics, internationalism, Punk attitude, more failure, paternalism, exoticism, social documentary, and image production. Can you tell us about the projects you’re working on next? I have been documenting Freemasonry in Haiti for the last three years. In Haiti, before the slaves’ revolt, the Freemasons were one of the few European institutions that allowed black membership. Freemasonry still thrives in contemporary Haiti, and its visual world pervades the Haitian imaginary. This project offers a glimpse of Haiti’s urban lower-middle class, exemplars of respectability in a world invisible to most foreign observers. Surveying these photographs reveals unexpected couplings: mysticism and civil society; secrecy and spectacle; solemnity and celebration; patriarchy and grace. I am also trying to find a publisher for my extensive collection of photographs I have made of airport prayer spaces that I have been taking for the last five years. These images, for me, mark a special intersection of modernism, magic, the contemporary and pre-Enlightenment values… which I guess, in some ways, is what all my work is about!